I had seen the pictures and heard all about Jesse’s love affair with his team, so it was not hard at all to put something together, written from Lisa’s perspective, to avoid confusion. And City are his pride and joy. 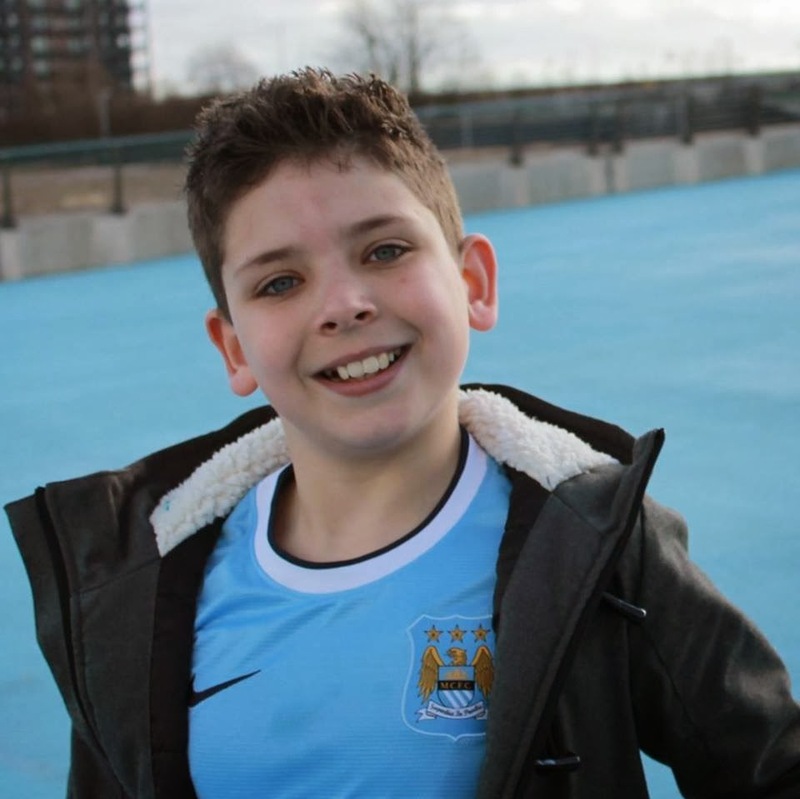 He’d grow into a faithful blue. With the same valiant heart and spirited soul. 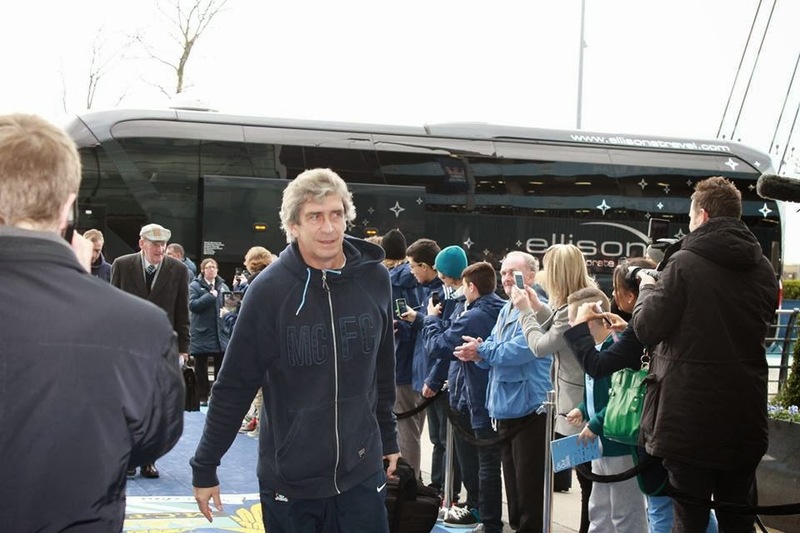 I’d love to see him walk out at the Etihad. 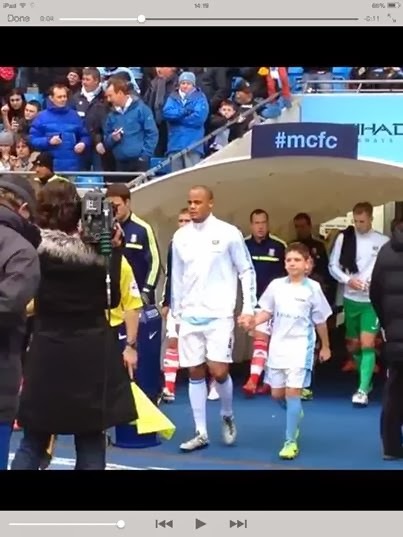 Football, a woman's nightmare some might think, but that perspective is completely turned on its head when you watch your footy-mad son walk out on to the pitch, live on TV holding his hero's hand! Where do I start...? My ten-year-old son has supported Manchester City ever since he has liked football and is always talking about his team, bantering with friends and family over who is better than who, etc. So, when my son was picked to be a mascot for his team I knew what a dream come true the experience would be. It started even before the day had begun, with Jesse receiving a brand new kit courtesy of Barclays to wear out on the pitch; four tickets so myself, my partner and my brother in law could all enjoy the experience with him and free parking on the day. For the whole week Jesse was bubbling with excitement at the thought of actually seeing his hero's up close and personal and worrying about what to say to them. Then, Saturday came, the day of Man City versus Stoke and we set off at 8am for the 3 hour drive to Manchester, all excited and nervous at once. When we arrived, we were so overwhelmed by the size of the stadium; we got lost and were 15 minutes late (oops!). Once we found our way, we were met by a lovely lady called Liz, who welcomed us and made us feel at ease instantly. As we were late, we set off for the private behind the scenes tour straight away. 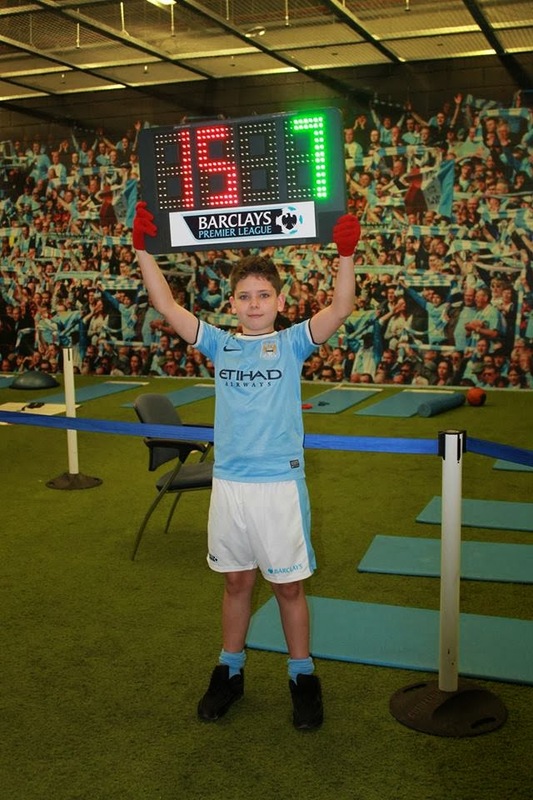 First stop was the changing rooms for Man City, and for the first time in his life Jesse was stunned into silence!! I cherished the moment for a minute, before encouraging him to have a look around and pose for some photos. 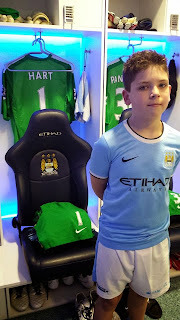 Jesse's hero is Hart the goalkeeper, as Jes also plays in goal, so his was the first kit he went to look at. 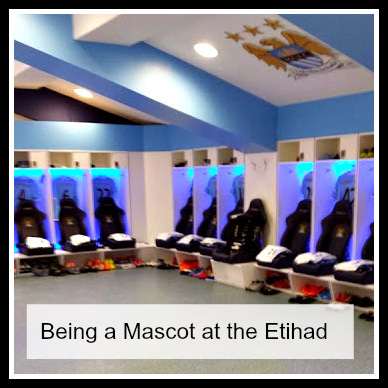 In awe, Jes took in the sights of all the players’ kits and many, many boots they had each. One player had eleven pairs of boots all he same! And they moan about us women and our shoes! 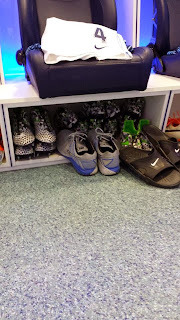 After all the photos, we moved on to the warm-down room where the players go after a game. Inside, was the sub board; this is the board the linesman holds up to call players off the pitch and swap them. We all took turns to pose while holding the board and certainly looked the part! 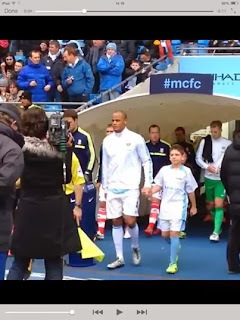 We were then led out through the tunnel onto the pitch area, which took all of our breath away. The enormity of the place was so overwhelming and the stadium was massive. We were told the seats for the subs were heated and covered so as not to get wet, while the seats for the away team didn't have either comforts. We posed for photos and moved on to the players’ lounge where we were served Jamie Oliver inspired burgers; hotdogs and pizzas, rolls, chocs, crisps and drinks until we could burst. After an hour of mingling with the other mascot and his parents it was time for the players to arrive. Jesse has taken his own Man City shirt to be signed and he put that on, while starting to pale and I could tell his nerves were kicking in. We waited either side of the carpet at the entrance for the players to arrive and when it suddenly turned dark, I thought the weather was turning, but it turns out it was the players coach blocking the sun and it was huge! It really did feel like a ‘celeb’ moment, with all the cameras around flashing away calling the footballers for a photo, with me in touching distance. Jesse and Josh (my brother in law) were led inside to meet the players personally and get autographs. Josh took photos for me and I have to say they were my favourite of the day. My son's face was such a picture seeing his team and making small talk with them. After the signing we went to watch them train for ten minutes before the game, Joe and Josh were shown to their seats while Jesse went into the tunnel to await the team. I waited above the tunnel ready with my camera to catch the proudest moment of my boy's life. We were told by Liz that they were on the way out and sure enough the commentator told us all to raise our voices for Man City, while all I could see from my angle was the back of the heads. I instantly welled up still managing to take pictures, while wiping the tears from my eyes. My son was walking out on live TV holding the hand of his team captain and was walking with such pride, what mum wouldn't cry seeing her child so happy? 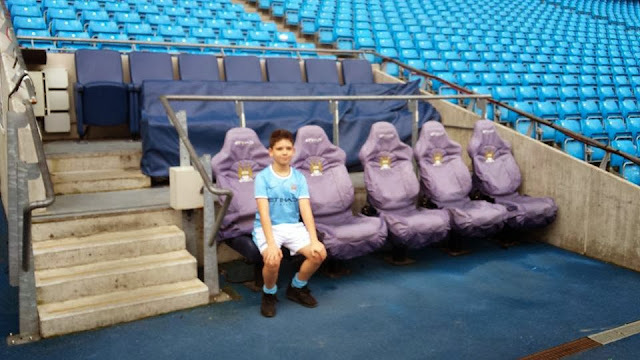 After lining up on the pitch and shaking the hands of all the Stoke players, Jesse led the other mascots over to the goal area, where they had a few minutes to shoot the ball at the famous Joe Hart. Jesse scored in the top left hand corner and ran around like a real pro in winning style. 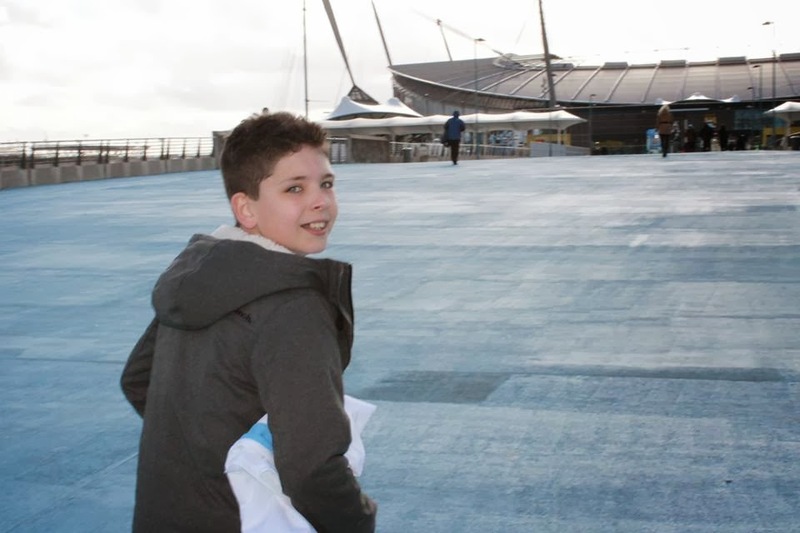 After they had all scored Jes led them back towards the tunnel and in that moment I could see my boy playing pro one day, he just looked like he belonged there. We met up after and Jes looked at me like I was Gone With the Wind, with make up smeared down my face from crying, I dreaded seeing anyone famous in that moment! We were taken to our seats to enjoy the game and were given fantastic seats on the corner post from which we saw a fantastic goal from Yaya Toure, which just topped the game off for us perfectly. On the way home Jes was full of it and didn't stop chatting about his day, until he suddenly went quiet. 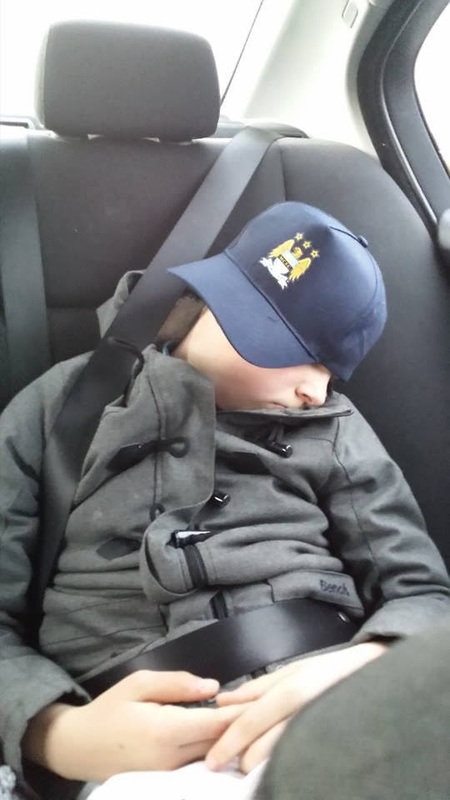 My little lad was shattered and the day had caught up with him, he was fast asleep. We drove home with the memories of an absolutely fantastic day fresh in our minds and one that will not be forgotten in a hurry. Thanks to everyone who made our day so amazing. Fantastic. What an amazing experience to be able to treasure, wonderful pictures too, have never seen anyone smile so much. Jesse smiles a lot also. What an amazing treat for him, great poem Lucy. Lisa is lucky to have a friend like you.